"Mother of Mercy—is this the end of Rico?" Practically since man started telling stories, there's been an immense fascination with the criminal element. I'm not going to bother to offer my two cents as to why this is, since it's been done to death elsewhere; but like most film buffs I absolutely love a great crime movie and the crème de la crème of crime is the gangster picture. Ever since Warner Bros. brought it to the mainstream in the early days of talkies, organized crime has entertained and challenged audiences with both critical and commercial success. Little Caesar, arguably the first important gangster film, no longer contains the punch it undoubtedly had when first released in 1930. 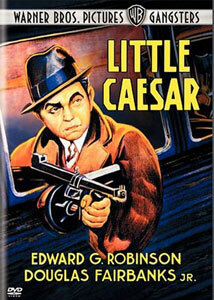 It starts with Caesar Enrico Bandello (Edward G. Robinson) as a low-level hood. Preferring to be called Rico, he knocks over a gas station with violent ferocity. Gunshots are heard from within, being promptly followed by Rico's return to his car. After this robbery, it becomes clear that Rico is not content with his place in life. Like the later classic, Angels With Dirty Faces, the story is really a study of two men with similar backgrounds who take different paths. Rico wants status and power, but isn't willing to work for it legitimately. His best friend, Joe (Douglas Fairbanks, Jr.), has the same dream of becoming successful, but doesn't share Rico's violent tendencies. As Rico rises in the world of organized crime, Joe leaves the gang to become a dancer. However, with Rico's increased power, it becomes impossible for Joe to leave his old life behind as Rico, rival gang members, and the police start to swarm around him. Mervyn LeRoy's adaptation of the novel by W.R. Burnett is a quick-paced, action-driven gem that doesn't offer much in the way of character development, but is a priceless component in the gangster genre's development. It's tough for me to watch this film without noticing its flaws. The camera is primarily locked off and the static images are only made more dull by the flat lighting. It may also be tough, at least for contemporary audiences, to be enthralled by the once-violent set pieces because there's no musical score to heighten the impact. As a matter of fact, the filmmaking here is a model for the flaws of early sound pictures. The cinematography is claustrophobic in order to accommodate the need to record sound and even worse is the acting. Every supporting actor, particularly Fairbanks and Thomas Jackson (who plays police Sergeant Flaherty), move like they're on stilts and appear to be more concerned with projecting their voice into the hidden microphone than actually acting. So why is this an good and important film? There are two reasons. First is the script—while this is not an operatic tragedy like The Godfather films, it is melodrama in the best sense of the word. The fast-talking delivery of lines and the dramatic structure of an anti-hero rising to the top and falling, due to his own devices, are staples of gangster stories even to this day. This film set the standard for the genre and heavily influenced the genre for at least the next 20 years. The second reason is Edward G. Robinson's performance, one of the best from when the movies learned to talk. There's a dynamic range in Robinson's line readings that is rarely seen in films of that period. Additionally, his mannerisms are perfect for the role of Rico. The cigar chomping that is now associated with pretty much any gangster originated here and, as far as I'm concerned, has never been equaled. Just look at how Robinson holds the cigar in his hand when he usurps his boss' power. This is a tour-de-force performance that, on its own, makes this an essential piece of American cinema. I can't honestly claim that this is a great film. When looking at the long list of gangster pictures, this one is surpassed by practically every James Cagney film, both versions of Scarface, and the much more realistic and dramatic installments by Martin Scorsese and Francis Ford Coppola. Nonetheless, Little Caesar is an invaluable commodity in the history of the genre and something that all film buffs should see. Image Transfer Review: Considering the age of this film, it's tough to judge this transfer. There's a lot of dirt, scratches, and print defects on just about every frame. Is this the fault of a bad transfer? My gut tells me that it is not, since Warner has such a marvelous track record of preserving classic films on DVD. Besides, the damage to the print gives the viewing of the film a context that a more glossed up transfer would not. The image is never distractingly bad and the black-and-white contrast is decent. This doesn't hold up to the stunning work Warner has done elsewhere, but it still treats its subject with respect. Audio Transfer Review: The mono English track is a blessing for purists like myself, since it helps to re-create the original theatrical experience. There's a lot of crackling and a loud hiss throughout, though again it's tough to say that this could have been avoided. Dialogue is always audible, as are the sound effects, and that's about all you need for a film like this. Warner Night at the Movies 1930—a collection of two shorts, trailers, newsreel, and the feature film to replicate the vintage movie-going experience. Features an introduction by Leonard Maltin. Re-release Foreword—the 1954 re-release preface to the movie. Extras Review: A nice treat from Warner on this release is the Warner Night at the Movies 1930 viewing option of the film. It is an effort to re-create the old days of cinematic viewing, when for a nickel you got a feature and a host of shorts. Prior to this feature starting there is a video introduction by Leonard Maltin (04m:05s) that runs down the list of what is to follow. Once you activate the feature, things get started with the theatrical trailer for Five Star Final, starring Edward G. Robinson in one of his rare non-gangster roles. Next is a newsreel (01m:43s) with real-life gangster "Legs" Diamond's girlfriend. It's stunning to listen to the reporter's monotone questioning and the obviously rehearsed responses by the girl and her mother. After the interview, things really get going with the short film, The Hard Guy (06m:25s), starring a young Spencer Tracy as a out-of-work dad who needs to provide for his family. Will he turn to crime like Rico, or will he work hard like Joe? Then there's an old Merrie Melodies short, Lady Play Your Mandolin (07m:14s), a musical cartoon that really tested my patience due to its obnoxious songs. Each of these features can also be accessed individually from the special features menu. An audio commentary by Richard Jewell is featured here. (If that name sounds familiar to you, it's because the 1996 Olympic bombing was incorrectly attributed to another man of the same name.) This film professor at USC gives some interesting insights into analyses of the film. At times, he more or less merely narrates the events on screen, but he has such a pleasant attitude and gives a good amount of information that this is a nice listen. There's also a documentary, Little Caesar: End of Rico, Beginning of the Antihero (17m:05s), with interviews from a plethora of film historians and Martin Scorsese. There's a lot of discussion about the film's comments on American society and audience reactions at the time, which is a nice compliment to Jewell's commentary. Other extras include the film's original theatrical trailer and the 1954 re-release foreword, which was included to make certain audiences didn't see Rico as the hero. The overall package of extras is an impressive addition to the DVD. Little Caesar is still an important film thanks to Edward G. Robinson's performance and its pioneering role in the gangster genre. The image and sound transfers are not especially noteworthy, though how much of this can be blamed on the technicians is unknown to me. The extras are a fine collection of material, making this a deserving inclusion in the Warner Bros. Pictures Gangsters collection.